Do I still collect toys? No, but this is no ordinary toy. 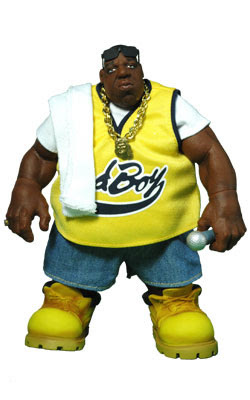 This is the extremely limited Notorious BIG action figure "Juicy" edition from Mezco toys and a must own for any Biggie fan. Dressed head to toe in the same gear from the Juicy video Biggie comes with gold Jesus piece, towel and removable sunglasses. There have been other versions made but this is one is by far my favorite, well until they make one in a Coogi sweater. Dope! !